DAVID LIVINGSTONE Autograph Presentation Signature. British (Scottish) missionary, explorer and traveller. Autograph presentation signature on paper. Signed and dated in his hand, London 20th November 1857. Paper piece measures approx. 4 x 2.25 inches. Laid down on part of an album leaf. A little foxing and slight glue stains. VG. David Livingstone had returned from his 1855-56 expedition, where he had been the first to make the transcontinental journey across Africa to the mouth of the Zambezi River. In 1857 he had resigned from the London Missionary Society to concentrate, instead, on finding new trade routes across the African continent and, at the date of this signature he was in London and actively planning his Zambezi Expedition to open up the river for trade. The expedition, which was ultimately unsuccessful, was commenced in the following March, with government funding. 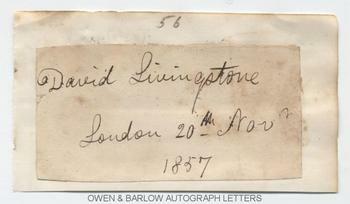 David Livingstone was already something of a celebrity, principally for his missionary work and, although his greater fame lay in the future (especially following his disappearance, discovery by HENRY MORTON STANLEY and his death in Africa) he was sufficiently celebrated to sign presentation autographs, such as this one, whilst in London.